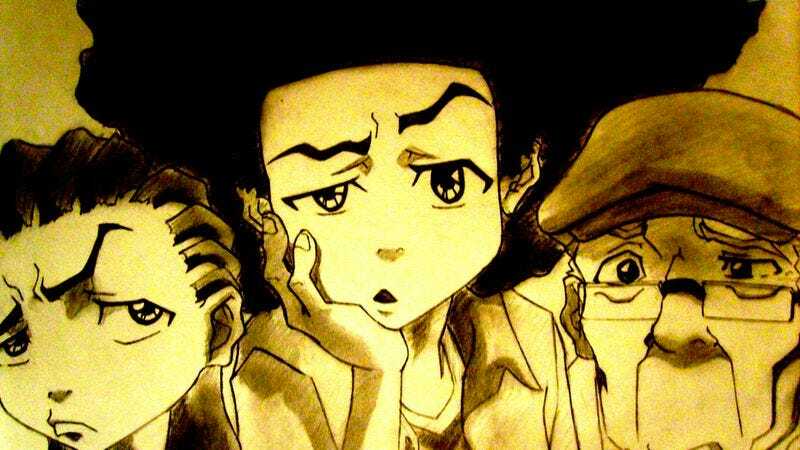 Following last week’s press release from Sony Pictures Television, Aaron McGruder, series creator of The Boondocks, has taken to the Facebook page of his upcoming new show, Black Jesus, to confirm that, although the much-beloved Adult Swim animated series will return April 21 for a fourth season after a four-year hiatus, he won’t be returning with it. McGruder’s recent claim that The Boondocks’ social media outlets had been “hijacked” had fans speculating as to his involvement and approval for this upcoming season. But in his diplomatic follow-up statement, McGruder looks back on the 20-year evolution of The Boondocks from comic strip to television show, thanks Adult Swim for his three seasons as showrunner, cites his responsibilities to audience and controversy, and quotes two “great white men” to reassure the show’s fans that “Hollywood is a business,” and also, “Don’t hold grudges.” He wraps it all up with a wink and a plug for Black Jesus, a show he acknowledges is sure to cause no further controversy.